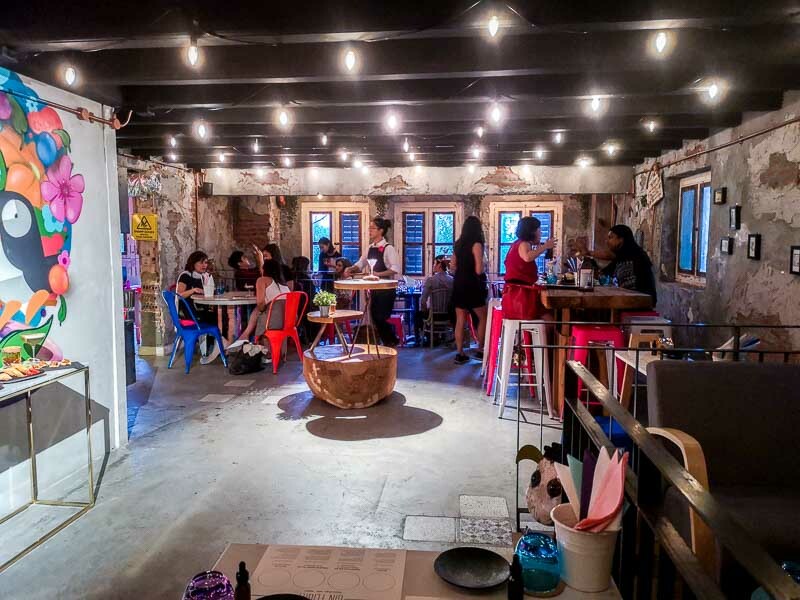 I recall there was a point in Singapore’s bar scene that hidden bars were all the rage. Everyone wanted in on these secret watering holes that veiled themselves behind non-descript entrances and passwords. BeGIN may not necessarily fit that mould exactly, but stepping into Penny Black and discovering a neon sign signalling a worthy discovery made me feel like I was about to enter an exclusive hideaway. 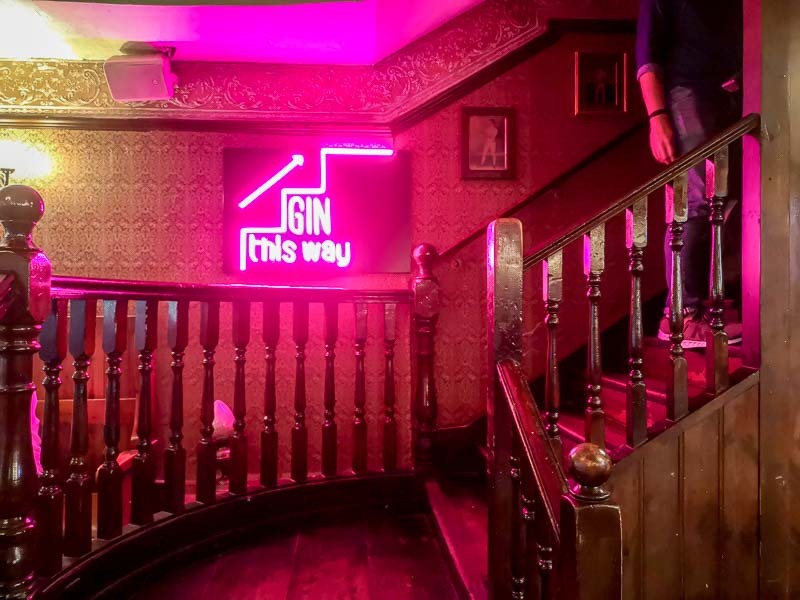 Once upstairs, I arrived at a low-ceiling concrete industrial space that’s supposed to be like the times when gin was first produced in run-down workshops to evade the ban. 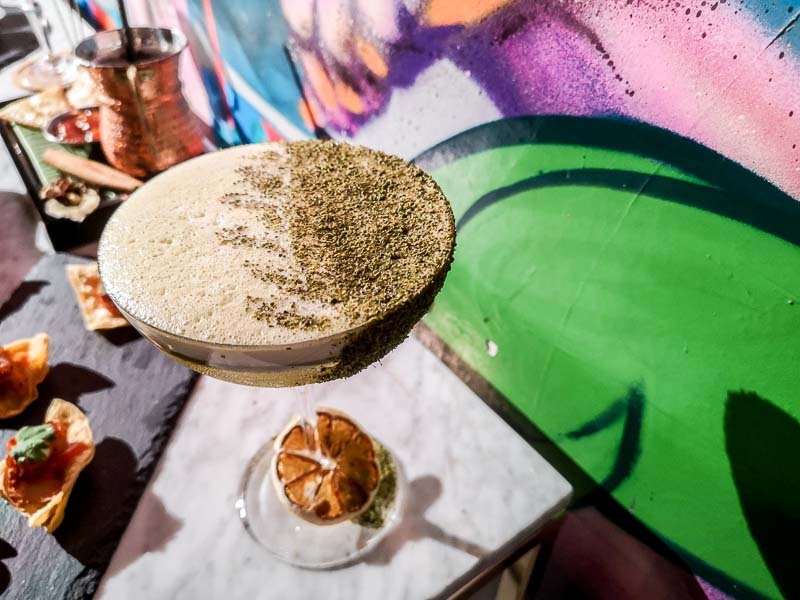 It soon became a craze of sorts during Britain’s Industrial Revolution and as such, the bar stocks up a hefty collection of over 50 types of gin from around the world. Despite its rawness, BeGIN’s charm lies in it not being dressed up nor beautified to look like any other fancy speakeasy bar. 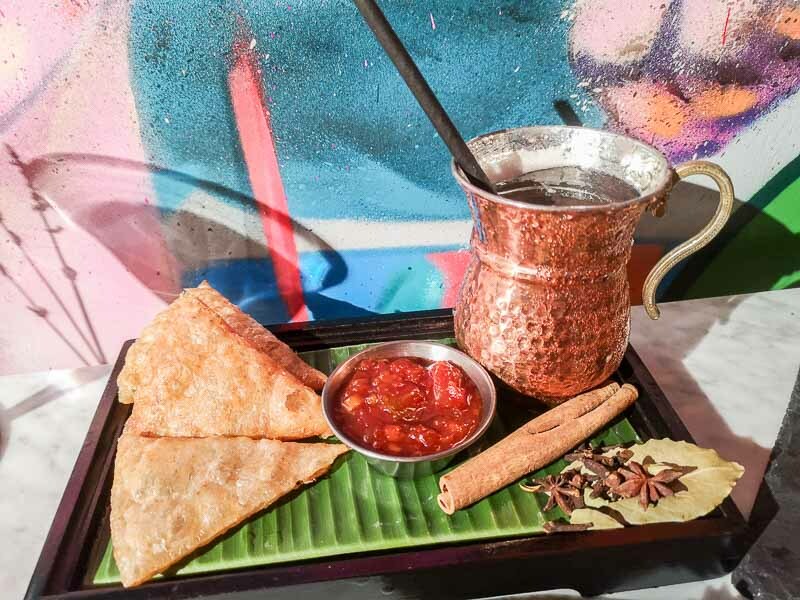 The food here at BeGIN aims to be more than just pub grub, and hopes to offer guests a taste of British-Indian snacks to pair with their spice-centric cocktails. 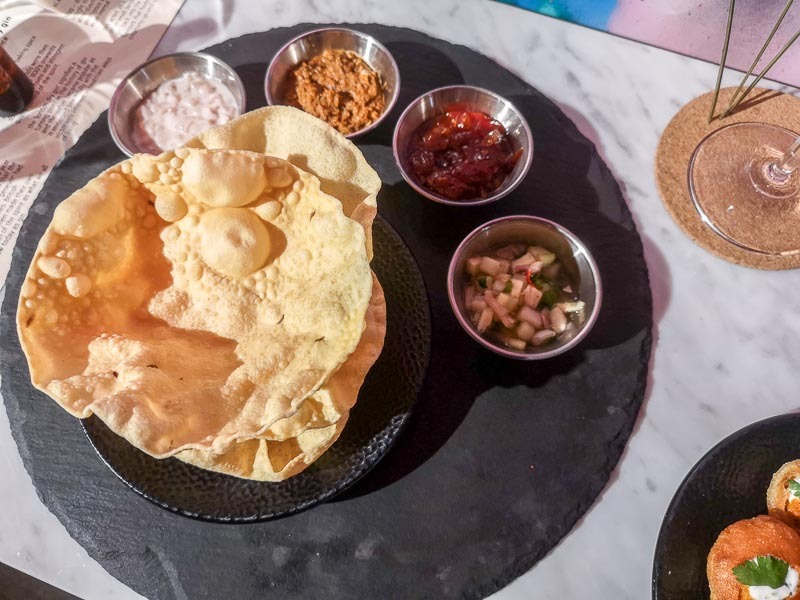 First up, we tried the Papadum With Royal Chatanee (S$2 for six pieces, with a set of dips for S$4). The four dips (clockwise, from left) were Onion Raita, Tomato, Chilli & Ginger Chutney, Asian Salsa and Spiced Cilantro Mint & Coconut. Out of the four, my favourite was the Onion Raita for its acidic edge that tapers off with the marriage of smooth cooling yoghurt. Throughout the evening, this snack made a recurring appearance as we probably re-ordered it about three or four times! 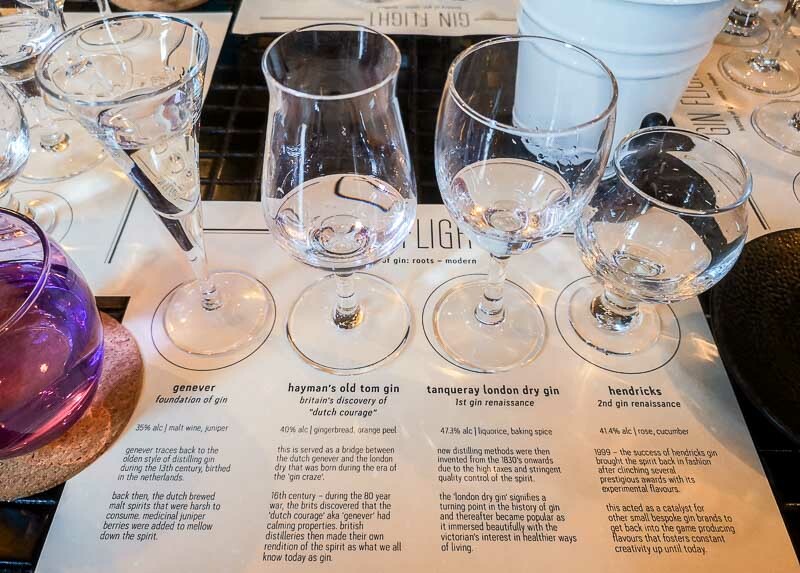 One of the more exciting elements of the evening was the opportunity to try the Gin Flight (S$28), following a timeline from one of the oldest gins to one of the more modern varieties. The general trend from oldest to newest is that the newer gins would prove to be smoother, as the distillation process would have improved dramatically over time. Surprisingly I really enjoyed Hayman’s Old Tom Gin, which is 40 proof. It had a rather sharp kick mid-sip, but it finished quite beautifully and boldly on the palate. The least appealing to me was the very first glass, which held Genever. Known as the ‘foundation of gin’, with malt wine and juniper, it dates back to the 13th-century method of distilling gin in the Netherlands. It was pretty harsh and not easily palatable, and it was a unanimous vote around the table that it was everyone’s least favourite glass. 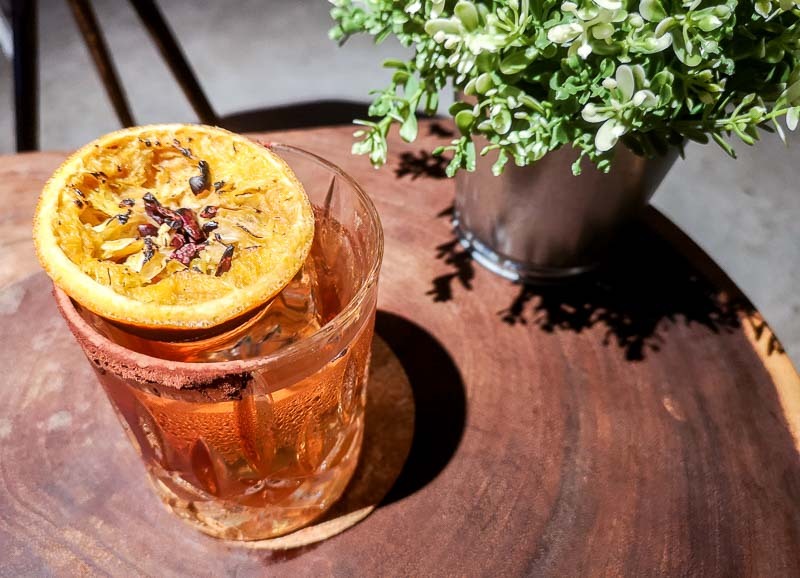 Lavender (S$25) is one of BeGIN’s signature cocktails and features dried lavender that’s meant to be inspired by HRH Queen Elizabeth II’s lavender garden. 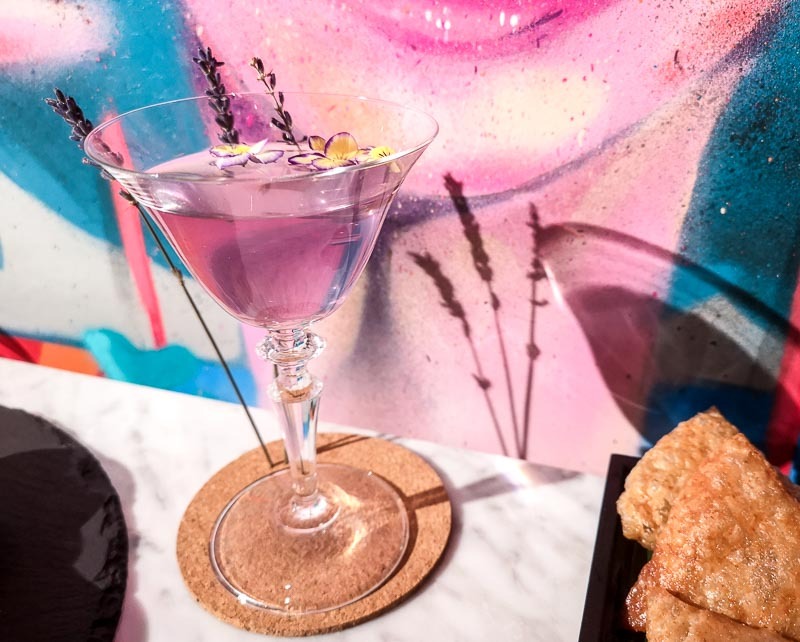 It’s made with butterfly pea-infused gin, coconut water, lavender syrup and elderflower. The taste was inherently sweet and is a mild choice for those who like cocktails that don’t have an overbearing taste of alcohol. It’s also helpful if you take a whiff of the drink prior to your first sip because I believe that that’s where the essence of the drink lies. 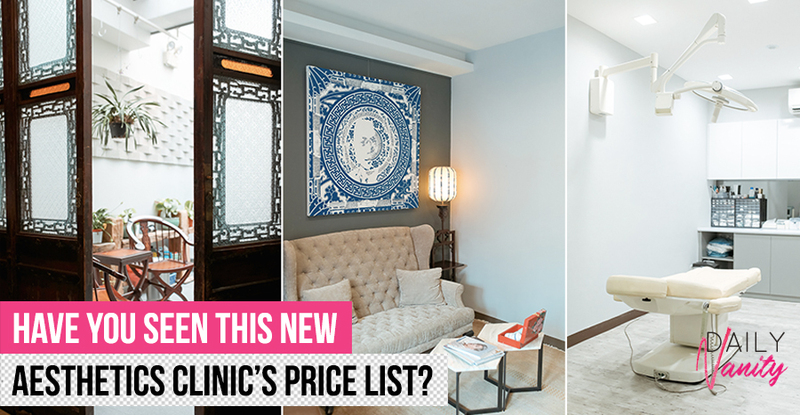 This felt like a two-for-one deal, as the Jagmohan (S$25) comes complete with a side snack. The base of the drink is tequila with pineapples, curry and cloves mixed in to create a savoury drink. 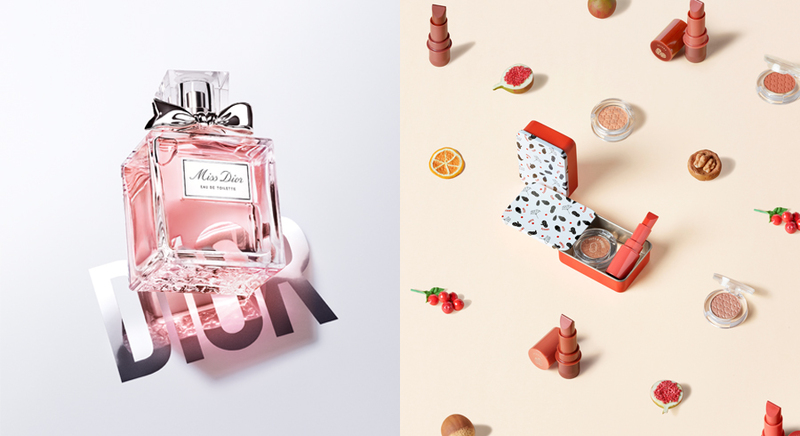 The best part of this set is actually the crisp snack that accompanies it. The dip is a tomato, chilli and ginger chutney, while the fried doughy chips were similar in texture to baked puff pastry with satisfying flakiness. Only after I’d wolfed down all three of these Samboo-sa Pastries (S$11 for three), did I realise I forgot to take a photo of its stuffed-to-the-brim insides. 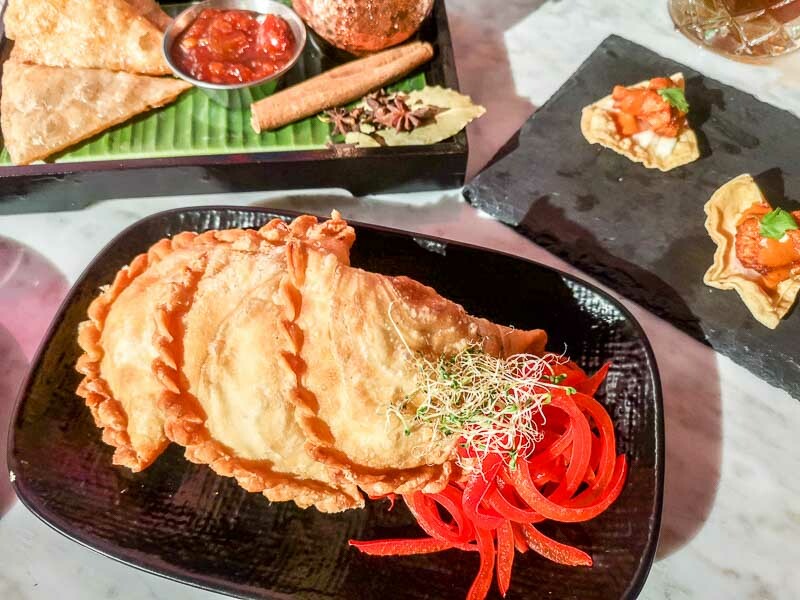 Just like our well-known curry puffs, these bites are filled with tandoori chicken masala and ample potatoes, making it a great accompaniment to your evening of drinks. It was mildly spicy, but what made it better was the familiarity of spices. Now that I’ve found a new go-to snack when I’m loading up on booze, I don’t know if I’d ever be satisfied with plain ol‘ mixed nuts again. Another hit with customers is the Yukie (S$22), a gin, lemon, fennel, egg white and matcha concoction. It’s undoubtedly creamy, but I wish the matcha was a lot smokier. It leaned more towards the sweeter profile and was unlike any of the other cocktails I’d tasted so far. I was told “a lot of ladies prefer this drink”, and that’s basically code for “sweet, gentle and stereotypically basic”. I won’t say that I hated it; it just didn’t have much complexity to it and was boring after just two sips. The last drink of the evening was Koko (S$23), a cocoa-infused rum with orange liqueur and espresso. In contrast to the previous drink, this packed potent notes of bitter orange and dark cocoa. It was a very “adult” drink, which reminded me of something that a whisky lover would go for. I was on the fence about it, but I definitely enjoyed it more than Yukie. 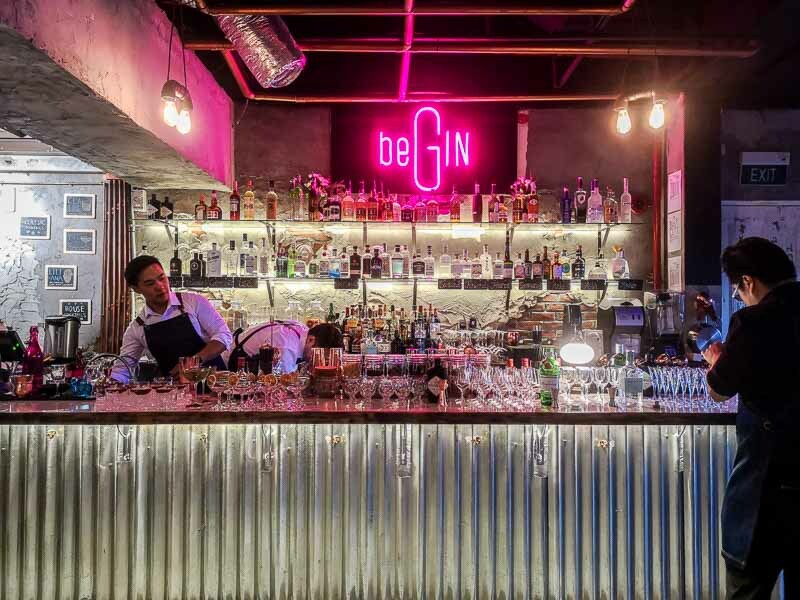 BeGIN as a concept is quite refreshing, and works well to educate both gin and non-gin drinkers about the historical value of the birth and growth of gin. However, the snack variety could be improved as it seems like almost everything is fried. Yes, fried food goes best with alcohol. 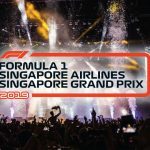 But after numerous bites of deep-fried dishes, it can leave a thin layer of grease on your palate. That voids your taste buds of the true flavours of the drinks and dishes you’ll enjoying throughout the evening. I might be fussy in this department, but I guess BeGIN isn’t my thing then.